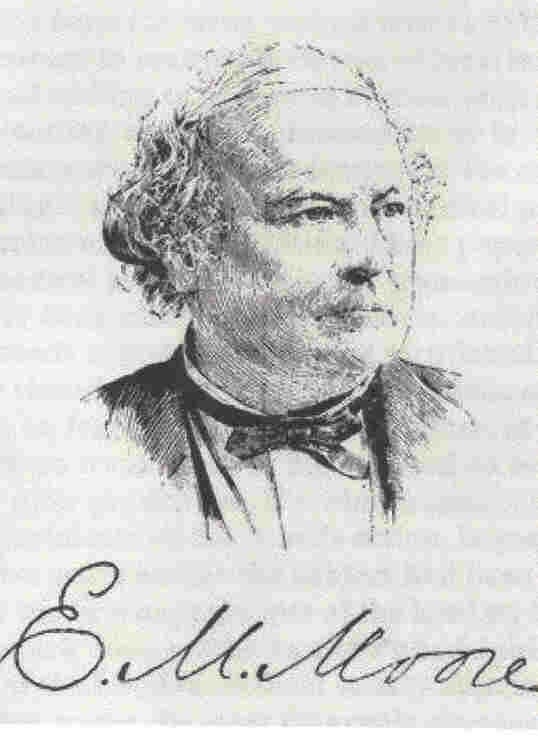 Much has been written about Edward Mott Moore, the well respected surgeon and philanthropist of Rochester, New York in the 19th Century. This, however, is an attempt to bring his childhood and family relationships to life. Lucretia Mott, sister-in-law to Abigial Mott Moore, writes of their departure in a letter. "“Lindley’s letter informing of his wish to dispose of his place (the Westchester property) “Was duly rec’d and the information spread among a number of friends, but I have not heard of any one from this way who would be likely to become a purchaser, unless it is myself, as I am tired of mercantile business and have thought and talked much latterly of withdrawing from it." 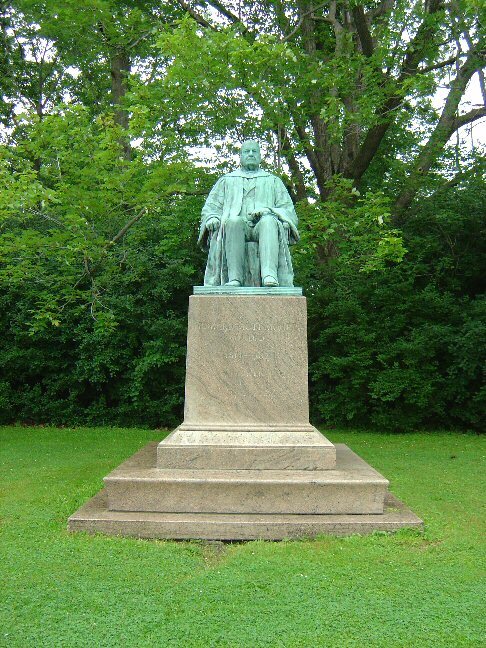 (4) And Thomas Cornell wrote of the journey. “Lindley M Moore hired a sloop which came to the wharf near his house in Westchester and received himself and family and all his household goods, including his dog Sambo and his high-bred swine, and transported them to Albany. Here he hired the exclusive use of a canal boat, which came along side the sloop and received the entire cargo, and carried it with without change to a point on the Erie Canal most convenient to the new farm. The two horses and the carriage Adam Mott and Edward M Moore drove the road through ‘the Beech woods’ of Delaware and Sullivan counties, all the way from Westchester to Rochester. The Erie Canal had just opened in 1825. Rochester wasn't chartered as a city until 1834. But there was an abundance of water power and the land was fertile. It was a flourishing frontier community. It seems it took him about four days and considerable extra expense to finally get to school. And then he found that he had nowhere to stay. "I Immediately inquired for John Williams & soon found him. He boards with his brothers & consequently was not able to take me, neither did he know of any private boarding houses, but said he would inquire among his friends & let me know in the morning." Edward and his friend searched for a place to board but found everything too expensive ($8.00 a week) and unfurnished, so he decided to board at the school. He had spent more than expected with the traveling expenses and now he needed a "bed, bedstead and bedding" from home. Also, the things that his parents had sent on ahead had not arrived. He was in a temporary room. All in all the trip must have been stressful, yet he writes about it as if it has been an adventure. Abigail was so proud of her son, yet missed him terribly. She wrote to him constantly - her letters being almost like a journal. She would begin on one day and add to it every few days until it was full. In 1834 when Edward's first letter arrived, Lindley came into the room teasing her. "Thy father went to Rochester this afternoon, and when he returned, he asked me who I would rather have a letter, of all my friends. I immediately replied, 'Edward' and he handed me them which I can assure thee was truly acceptable for I began to be very anxious to hear how thou got along, and how thou fared after getting thy place of destination. With regard to thy bed, I hardly know what to say - I am sorry thou did not take one with thee. ----- I have sent a feather bed, a quilt - a blanket - 3 sheets 2 pillow cases - a pillow - all enclosed in a straw tick which thou may get filled and then I think it will do very well to be on the floor, if it is not too degrading. I could not very well spare the cot - and I thought it would be attended with some difficulty to do so, even if I could spare it." (7) Sometimes, over the course of the next five years, she began her letters by asking him to write more often. Our favorite opening greeting is one from 1838 when Edward was resident physician at the Friends Asylum for the Insane in Frankfort. "I hardly know how long it is since I wrote to thee before, but believe it is quite time to begin another sheet, but why and wherefore do we not hear from thee? Art thou so constantly engaged with thy patients, anxious for their restoration of both mind & body to health? Or dost thou almost forget that there still lives in Rochester a family who feel deeply interested in thy movements? Let the cause of thy silence be what it may, do try to remove it." (8) Edward was busy, but he always wrote back. And Abby was delighted when his letters would arrive. Edward persevered with his studies even though he missed being with his family in Rochester. In 1837 he wrote, "Your last two letters hinted something about your leaving Rochester & nothing that I have lately met with has made me feel so unpleasant as the idea of living at a distance from you as a permanent arrangement. Where can you go better, it is true that the house & lot if sold would produce enough to purchase a small piece of land & soul & body could be kept together at a less expensive rate, but I suppose land could be purchased not more than two or three miles from R at the rate of $60 per acre. Or if father thinks he must do some business in order to keep up the supply of the wherewithal, could not something be hit upon in R as well as anywhere else. I can not propose anything however, but should be willing to make some sacrifices rather than have the family separated more than can be avoided." (9) Abigail's brother Richard was in Toledo pleading with everyone to come west. 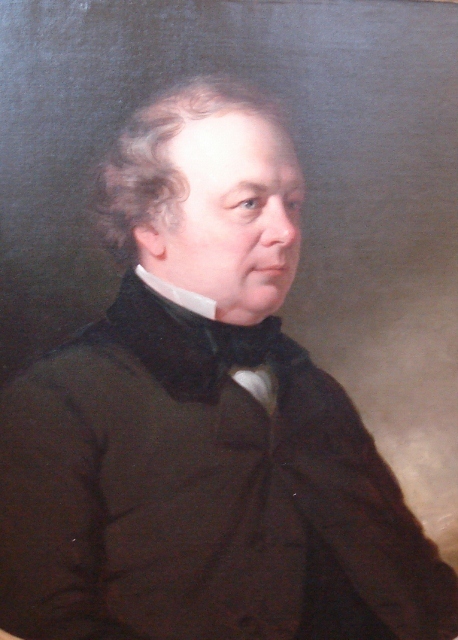 Lindley did sell his land, but did not move from Rochester. The family instead relocated to 5 Elizabeth Street in downtown Rochester. As has been stated above, Edward was very close to his family and was anxious to get back to Rochester. In 1839 he received "the most melancholy letter he had ever received from home." His grandfather, Adam Mott, had just died. His mother, Abigail, was suffering from chills and a fever, which later was confirmed to be the beginnings of the consumption that took her life in 1846. His brother, Murray, was suffering from "hip disease" and was in so much pain that he was using a wheelchair. He died of consumption in 1846. His sister Mary at the same time was also suffering chills and fever. She died of consumption in 1844. His sister Ann had come down with "a very severe turn of ague in her face." Abigail writes in this letter to Edward, "Thou will be almost ready to conclude thou has better come home and be 'resident physician' in thy father's family." (16) In June of 1839, his mother, Abigail (Abby), gave birth to Alice Marie. Abby was 44. Her oldest son, Edward, was 25. And Abby was sick with consumption. Although the baby seemed healthy when it was born, she lived only two months, and died probably as a result of her mother being so sick. What had once been a very happy home, was in for some years of sorrow. Everyone looked to Edward for support and encouragement. His sister Ann wrote in 1839, " We miss thee, we need thee as a physician, as counselor and companion. We want thee for everything we can from thy station as eldest son and brother, however much mother wants thee, she says that thou knows best and she will be contented at whatever is best for thee, the rest of us are more selfish or our natures are less subdued." (17) Edward finished his year of residency at the Frankfort Asylum and came home to Rochester in 1840 to help out his family and set up his medical practice. By 1841 Edward was doing pretty well with his medical practice. His aunt Lucretia Mott wrote, "Abby (Mott Moore) is in poor health - cough & raises a good deal - the day before they left, some blood. Edwd. has a moderate share of practice - is making rather more than a living. Lindley out of business at present, talks of a school. Sarah wishes he would engage in one at once - They would like the superintendence of Havreford." (18) Lucretia Mott was the well known Quaker abolitionist. She was married to Abigail's brother, James Mott. It was in Vermont that Edward met the lovely Lucy Richards Prescott. They married in 1847 in Windsor, VT. He was thirty three years old and Lucy twenty seven. According to the obituary on Lucy, after their marriage in VT, "Dr. and Mrs. Moore made their journey to this city (Rochester) in a stage coach, for railroads were then in their infancy. Upon their arrival here they roomed in the old Eagle hotel, where the Powers building now stands, for three years. They began housekeeping at 5 Elizabeth street, at that time the center of the social life of the city. After living there for ten years, they moved to 74 South Fitzhugh street, which became the homestead.." (20) Five Elizabeth Street was the home of Edward's parents, Lindley and Abigail Moore. Their first child, Mary Pettes Moore, was born about two months after that letter was written, so I imagine Edward and Lucy were anxious to get into their new home. Edward continued travelling to Vermont to give lectures and Lucy probably spent some time in Vermont with her mother and step-father. In the 1850 census Lucy and two year old Mary P. Moore are listed both in Windsor VT and in Rochester, NY, and their second son, Edward Mott Moore, was born in Windsor Vermont on Aug 25, 1850. Lindley wrote to his son in June of 1850, sending "My love to Lucy, when thou writest to her," (23) so Lucy must have already been in Vermont awaiting the birth of Edward. That same letter makes reference to Edward's forceps business. 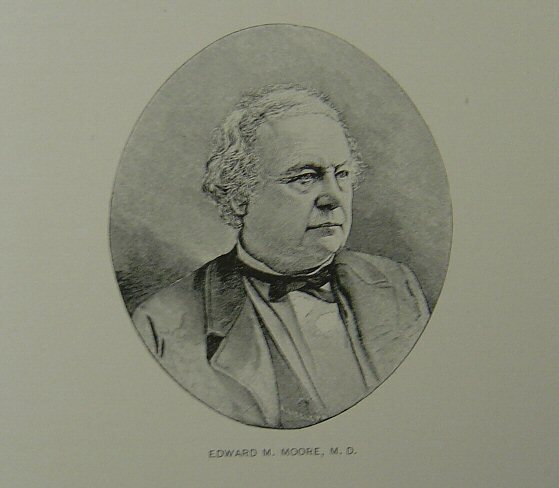 Dr. Edward Moore was innovative with his surgical procedures. 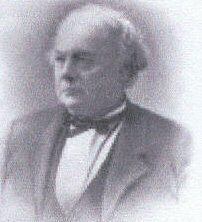 A Dr. Clawson, a former student of Edward Mott Moore, in 1911 gave a speech at the Schuyler County Medical Society in which he credited Edward Mott Moore. 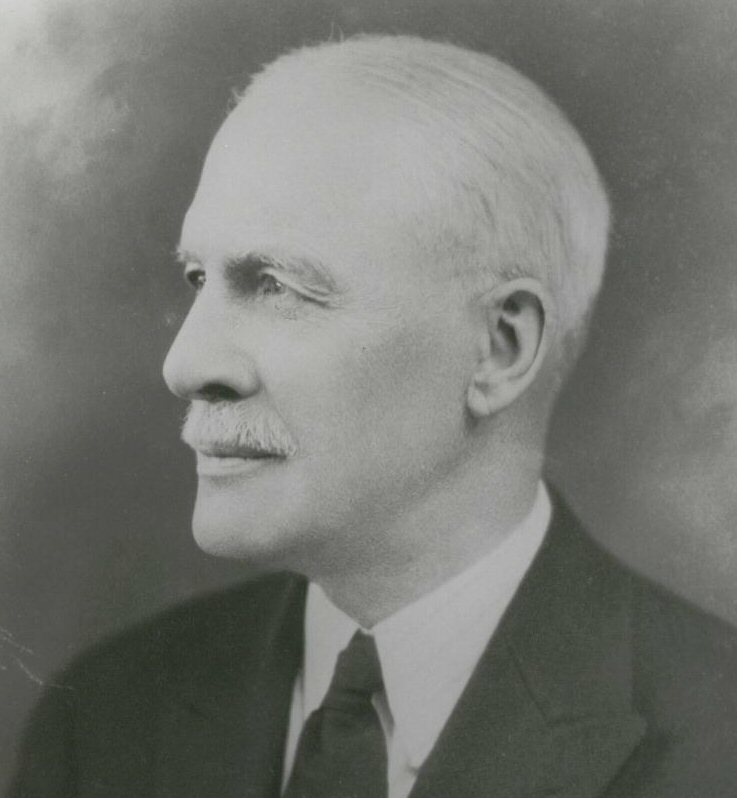 "Professor Edward M. Moore, the lecturer on surgery, had a national reputation as a skilled operator. Among the important subjects which he taught was the manipulative method of reducing dislocations. At that time an efficient hemostatic forceps was scarcely known, and an operator's skill was measured by his intimate knowledge of anatomy and the avoidance of arteries to prevent loss of blood. I saw him make several operations for stone in the bladder without the loss of an ounce of blood. He was the inventor of a lithotrite which has been the model for nearly every instrument used to crush urinary calculi. He was very successful in his operations notwithstanding the fact that aseptic and antiseptic surgery was unknown. In his teaching he distinctly warned us that in the majority of cases succeeding an operation, if extensive, we might expect surgical fever. He always, however, insisted upon surgical cleanliness and many of his operations were not followed by surgical fever. In such cases his common expression was "we are getting union by first intention." Together they had eight children. A cousin, Lottie, taught the children in their home and had them write letters to their mother every Tuesday. From these letters we learn that Lucy used rewards as a way to garner good behavior from her children. If they were very good they received ten kisses from their mother at night. Some of the boys only got three kisses on some evenings but daughter, Abbie, usually got her ten. These letters, which are held by the University of Rochester with the Edward Mott Moore Papers, are transcribed on the pages of each child. The obituary on Lucy also reads, "It was one of her characteristic tenets that reward for good was a better corrective measure for children than punishment for errors and it is recalled that she gave as a reward sticks of candy to each when they deserved them. It was a supreme pleasure for her, her children say, to watch their anxious faces at they pulled from under their pillows in the morning their reward package and counted the sticks to see who had been found the most obedient and best behaved." 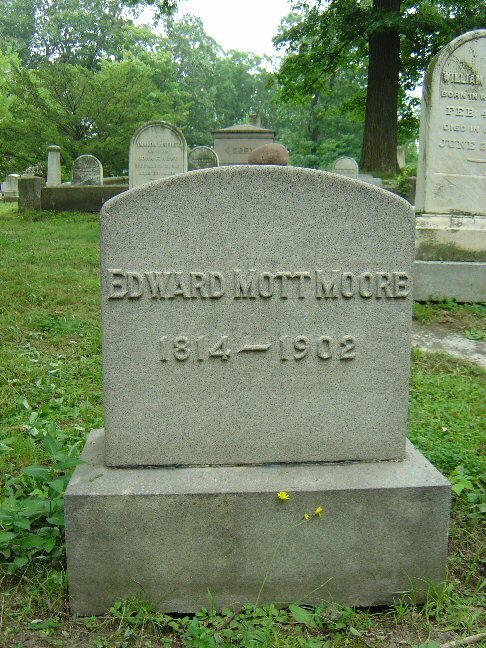 Dr. Edward Mott Moore also took time to be with his children. In 1869 Abbie Joy wrote, "My Dearest, darling Mama, I can not write you a very long letter as I have commenced late, the reason why I did not commence earlier was because Pettie (her older sister Mary Pettes Moore) was reading to us and did not get through till it was pretty late. This morning Freddie and I went out in the country to ride with Papa about three miles." 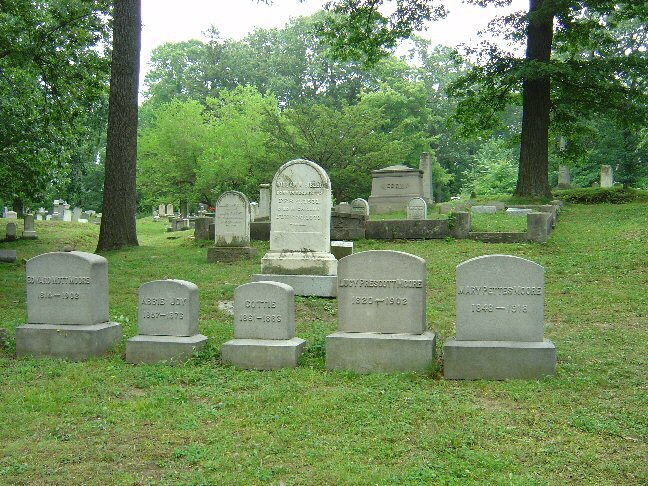 Their oldest child, Mary, never married and lived with her parents until their deaths in 1902. Their sons, Edward Jr. and Richard became doctors and had their practices in the same house as their father although their practices seem to have been independent. The book Adam and Ann Mott by Thomas Cornell states, "Each has his own office, in their father's house, and each his own patients." Their son, Samuel, went to law school and was manager of the Rochester Title Insurance Company. Their other two daughters, Abbie Joy and Charlotte died of diphtheria. Charlotte was only two and Abbie Joy nineteen. Lindley Murray Moore went to the University of Rochester for two years but did not graduate and Frederick Pettes Moore seems to have never attended university. This must have been hard on the parents since they placed such an emphasis on education. However, the parents seem to have helped them financially to go into business. In 1880, at the age of 28, Lindley Murray Moore went into business for himself, manufacturing baskets on Plymouth Av (corner Pinnacle) near the Erie Canal. 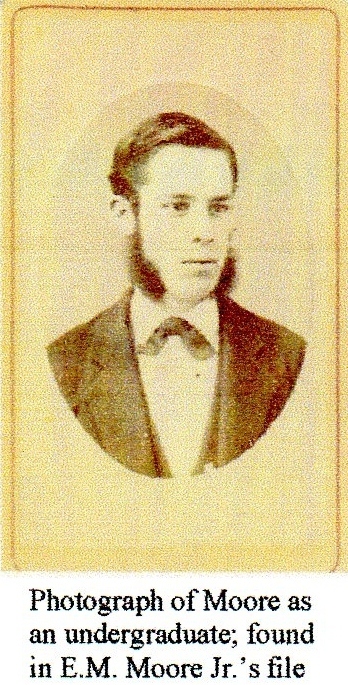 He must have borrowed the start-up money from his father, because when his mother died in 1902, her will stipulated " I do not desire my son Murray to share in the division of my said estate for the reason that his father, from whence I derived this property, advanced to him more than his share of the estate would have amounted to had it been divided among all his children." 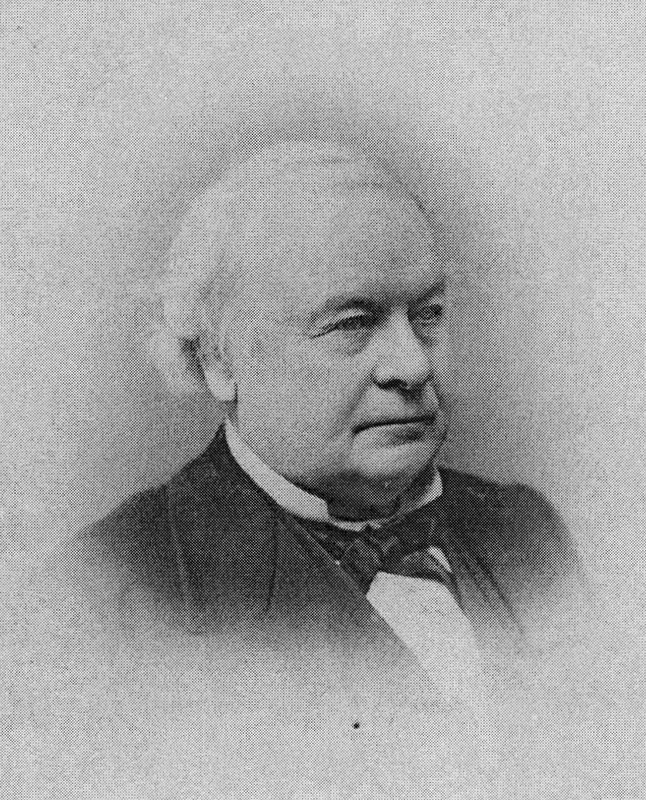 Frederick Pettes Moore went into business with his brother for a short time but eventually branched out on his own and was successful in selling life insurance for the Equitable Life Insurance Company. 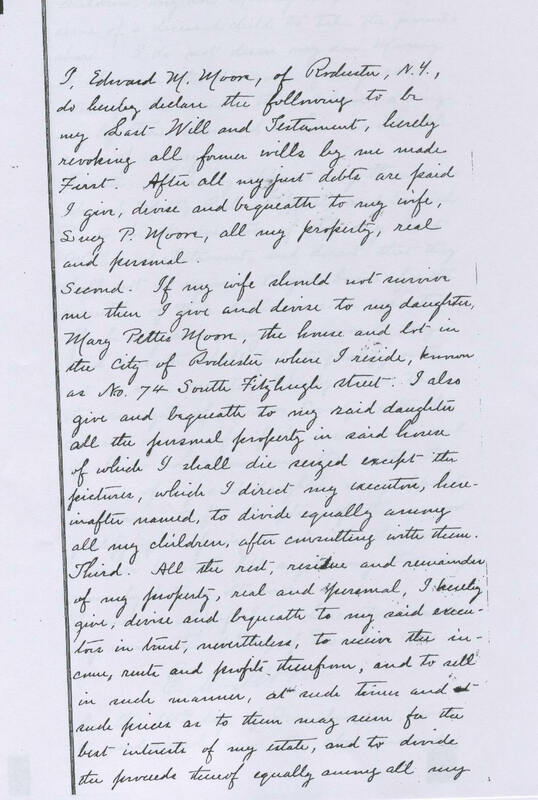 (3) Letter from Edward Mott Moore to his parents, Philadelphia, 3rd Mo, 6th. Letter on file with the Edward Mott Moore Papers at the University of Rochester. (5) Daniel Mott, born 10 Oct 1763, was a first cousin to Edward Mott Moore's grandfather, Adam Mott. (6) Letter from Edward Mott Moore, to his parents, Troy 5th Mo. 4th 1834. Letter on file with the Edward Mott Moore Papers at the University of Rochester. (7) Letter from Abigail and Lindley Moore to Edward Mott Moore, Rochester 5th Mo. 5th 1834. Letter on file with the Edward Mott Moore Papers at the University of Rochester. 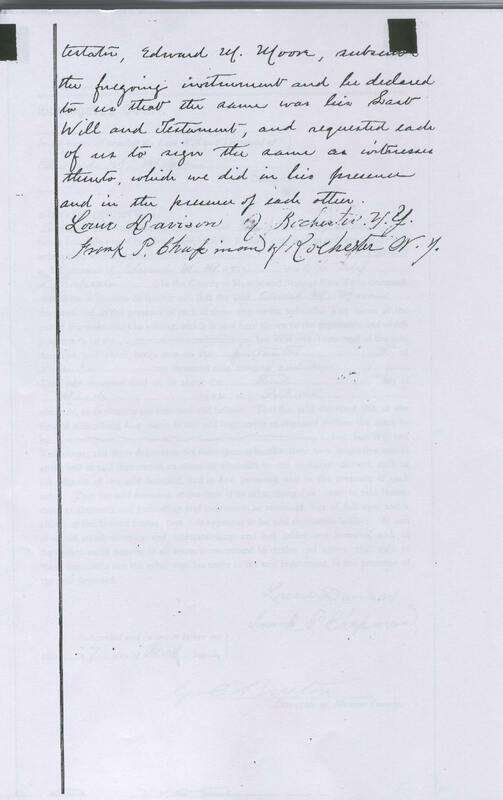 (8) Abigail Mott Moore to Edward Mott Moore, Rochester, 12th Mo. 12, 1838. Letter on file with the Edward Mott Moore Papers at the University of Rochester. 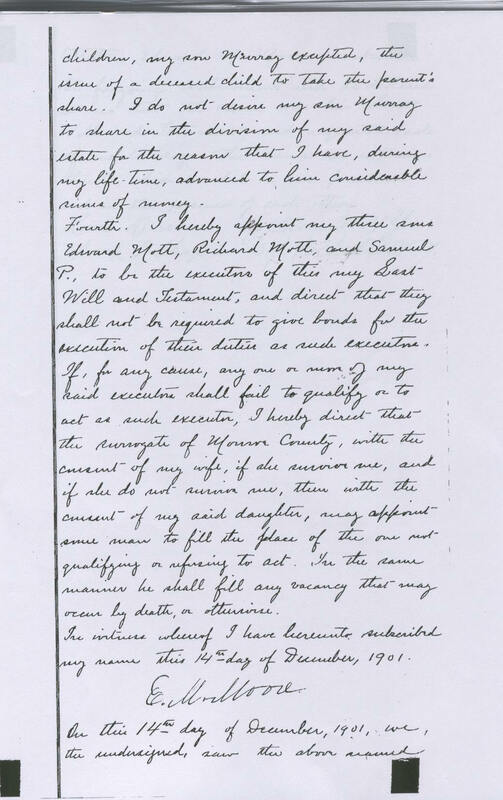 (9) Letter from Edward Mott Moore to his parents, Philadelphia 3rd Mo. 6th, 1837. Letter on file with the Edward Mott Moore Papers at the University of Rochester. (15) A Treatise on Human Physiology; Designed For the Use of Students and Practitioners of Medicine by John c. Dalton, M. D. 1867. (17) Letter from Ann Mott Moore to Edward Mott Moore, Home 8th Mo., 25th, 1839. Letter on file with Edward Mott Moore Papers at the University of Rochester To read more about the health of his mother and siblings, see the pages for Anne Mott Moore, Lindley Murray Moore , Mary Hicks Moore, Richard Mott Moore , Alice Marie Moore and their mother, Abigail Lydia Mott. (24) Medical Society of the County of Schuyler, Reported by John M Quirk, M.D., Secretary. Thursday, March 30, 1911. (28) Transactions of The New York State Medical Association for the year 1885, by John Shrady, M. D. pp 195.